“Ultraviolet (UV) light is electromagnetic radiation with a wavelength shorter than that of visible light, but longer than x-rays, in the range 10 nm to 400 nm, and energies from 3 eV to 124 eV. It is so named because the spectrum consists of electromagnetic waves with frequencies higher than those that humans identify as the color violet.” Source. There are several ways of producing UV light, that include natural sources (Eg. 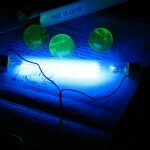 the Sun) or artificial sources (UV bulbs, UV tubes, N2 Lasers, etc). I have tested two UV Light tubes: a black light UV tube, and a germicidal UV tube. There two correspond to UVA and UVC spectrum. The reason for this is that my UVA tube emits long wave UV radiation and very little visible light. 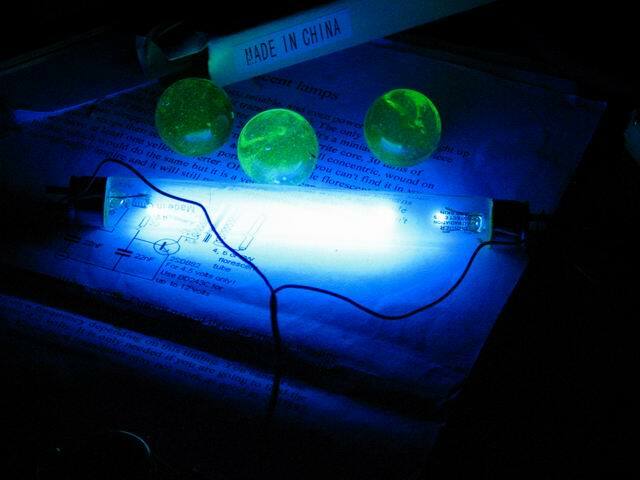 In the third picture, the glass ball is an uranium doped glass. 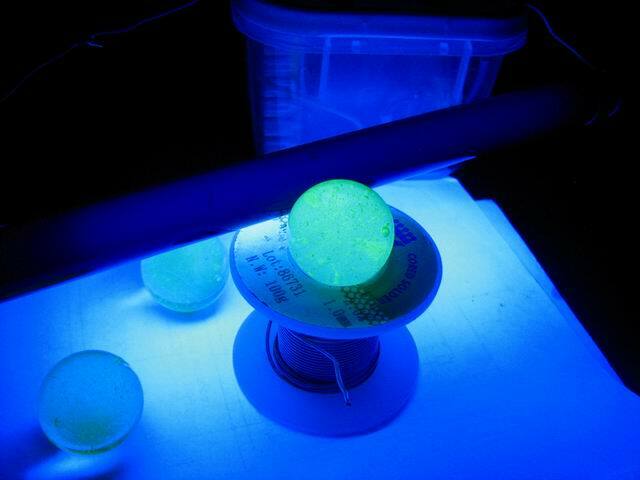 It shows greenish fluorescence when exposed to UV. See an article on this topic, here. 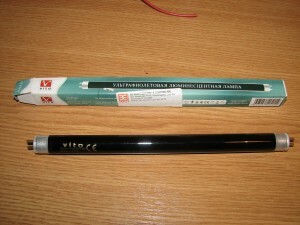 This type of tube looks black when non energized, as the deep-bluish-purple glass called Wood’s glass, is a nickel-oxide–doped glass, which blocks almost all visible light above 400 nanometers. Unlike the other UV subdivisions with shorter wavelength, the UVA emits lower energy radiation, that doesn’t cause sunburns or skin cancer. Instead, UVA is capable of causing damage to collagen fibers and destroying vitamin A in skin. 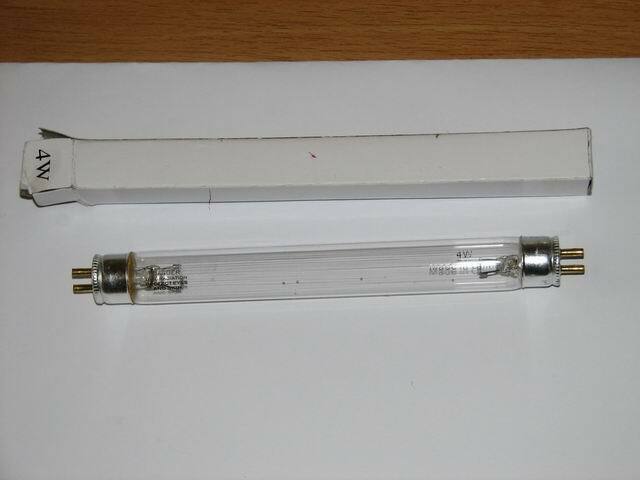 I got these tubes at a fair price on Ebay. They were manufactured to be used in germicidal applications. 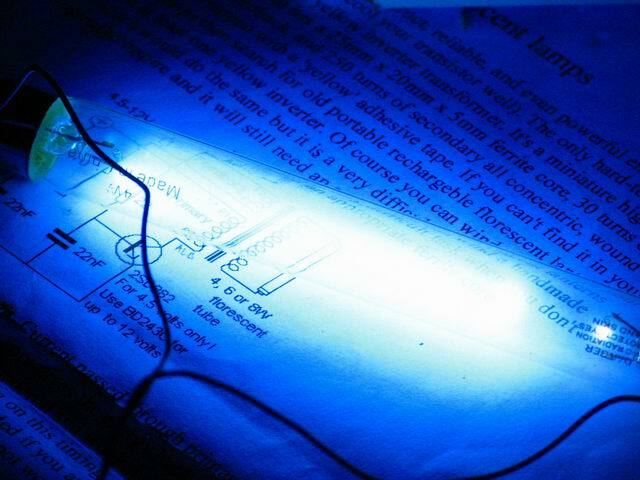 Most of the light they produce is in the 280 nm–100 nm spectrum. The sun is a natural source for UVC radiation. Some of the UVB and UVC radiation is responsible for the generation of the ozone layer. 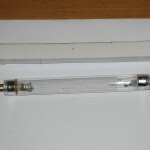 After running my UVC tubes for a while, ozone smell could be detected in the air surrounding the tube. In this video you can see that if the magnetic field moves, the plasma moves in such a way that magnetic field lines cannot slide across the plasma. 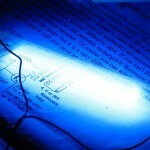 UVC rays are the highest energy, most dangerous type of ultraviolet light. Unshielded exposure of the skin or eyes to UVC light sources is quite dangerous. It can produce DNA damage that leads to skin cancer, since it penetrates the skin, so protection is required. The resistors need to be at least 5W, and the transistor can be a 2n3055. The primary consists of 30 turns, for the feedback you’ll need 15turns and 250 turns of secondary, all concentric. You might need to be able to swap feedback (or primary) connections in case of wrong phase polarity. Instead of the MPSA42 / MPSA92, you can use any other generic PNP/NPN pair of 0.5A minimum current. The Mosftet (IRF540) will be needing a heatsink. You can use a different power mosfter or a power BJT transistor instead (eg. 2n2055). The secondary can be winded manually or you can use a flyback secondary. 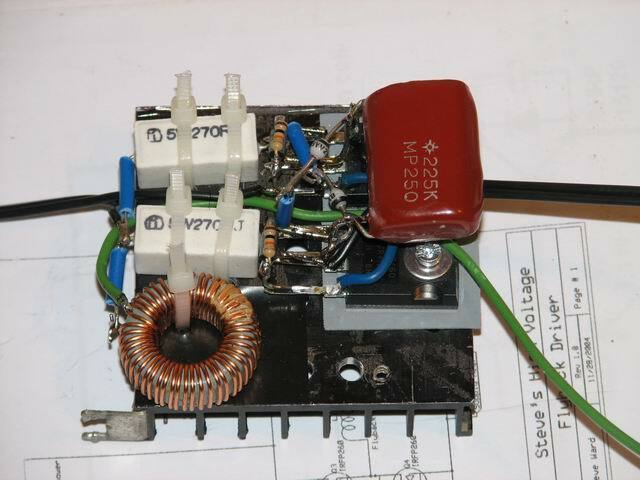 The advantage of this circuit is that you can adjust the frequency using the pot. The next few days, I’ll be publishing an article on various high voltage sources, so we’ll see more on these later. Keep the electrons in flux! I’m glad you find this site useful. Come back any time. Thank you for this great project,, but theflyback transformer has only 2 terminalsfor primary and 2 for secondary,, u r using 6 !!! how is that ?? Thank you for thisreally great website,, but the flyback transformer has only 2 terminals for primary and 2 for secondary,,u r using 6 terminals. another thing,, i need a high votage source (10-15KV) in order to make an N2 laser,,which circuit do you advice me to use ?? May I ask an extremely silly question ??? 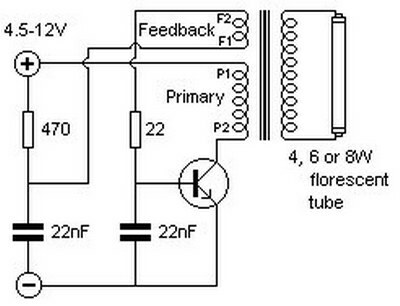 Is the output of the flyback DC or AC ??? I have a 45W UVC lamp and would like to use your circuit to power it to reduce dust mites – can you recommend how components need to be scaled for higher wattage? @Hazem, in the video the output is DC. Do you have one that would produce the frequencies of 254 nm with a varying power? Let me know if you need help. But believe me when saying that the best thing with these inverters and their coils is to start experimenting: after wasting a few hours and a few non-working coils – you’ll know everything you need to get some great results. you’ve got a nice blog. love your macro shots! i have decided to make a flyback transformer for a science project, and i am not so great at this area. for solution 1 (the one i am doing) what exactly do the capacitors do? i need to know this for my write-up. i have seen many other circuits like this one, only they don’t use the capacitors; would i still be able to light up a uv light without them? yes, the inverter will work even without the capacitors. by powersupply from back emf. I’m curious about the use of the pnp and npn transitors in push pull configuration. I’ve been able to drive an IRF 250 mosfet with just the 555 output, 0~7 or 10 VDC. How does the push-pull help and is the 540 a much better choice…?